WASHINGTON – Politics in West Chester, Pa., can be summed up by looking at its mayor. Carolyn Comitta is the borough’s first woman mayor, but what she is most proud of is that she is also its first bipartisan mayor. She won the Democratic primary in a 2009 a contested race. When she saw there was no name on the Republican primary ballot, she held a write-in campaign and won that primary too. “I’m very proud of that, and it really says a lot about our community,” Comitta said. West Chester is the county seat of Chester County, one of the four counties surrounding Philadelphia County, and an important county for the presidential candidates in November’s presidential election. “To me, that’s what makes Chester County such an interesting story for purposes of trying to take one county and have that be a microcosm for the entire macro discussion on how this presidential election shakes out,” Costello said. Despite its proximity to the historically Democratic Philadelphia, the county is predominantly Republican. As of July 23, there were 147,866 Republicans, 124,415 Democrats and 21,076 independents registered in the county, according to the Pennsylvania Department of State. Despite this, John Kennedy, associate professor of political science at West Chester University, said he has seen a change in Chester County since he began working at the university. He said he moved to Montgomery County, northeast of Chester County, in 1990. Graphic by Jessica Sabbah. Data provided by the Pennsylvania Department of State. 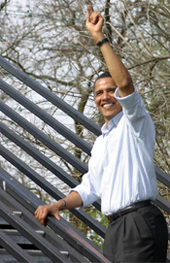 In fact in 2008, Obama won Chester County with 54.2 percent of the vote, marking the first time a Democrat carried the county since 1964 when Lyndon Johnson won. In the previous election, George W. Bush won the county with 52 percent. Rob Brooks, executive director of the Republican Committee of Chester County, said Obama carried the traditionally Republican county because people in Chester County were unhappy with some Bush policies. “The pendulum was swinging back, I think. At this point, there wasn’t much enthusiasm. People were looking for a change, and that happens in politics,” Brooks said. Michele Vaughn, chair of the Chester County Democratic Committee, said voters saw Obama as a person who would bring the change they were looking for and be the leader the country needed. With the next election three months away, both Brooks and Vaughn said volunteers for both parties are enthusiastically campaigning for their candidates. The Quinnipiac University Polling Institute’s latest swing-state poll, released Aug. 1, shows Obama ahead of Romney in Pennsylvania 53 percent to 42 percent. The poll surveyed 1,169 likely voters and has a 2.9 percentage point margin of error. Come November, Chester County will be an important battleground for both candidates. It is important for Obama too, but Kennedy said a win in Chester isn’t as important for the incumbent. Graphic by Jessica Sabbah. Data provided by the Pennsylvania Department of State and the Federal Elections Commission. If Obama loses by two points in Chester County, Kennedy said the president would probably still win the state. But if Obama loses by 10 points or more, his chances of carrying the state are lower because he probably will not be winning surrounding counties, Kennedy said. Chester County voters may think about many issues before they vote. But “just like anywhere else,” Brooks said jobs and the economy are some of the most important issues. “I really think that’s what people see, that’s what people hear about, that’s what people talk about, that they have friends, family, neighbors that don’t have jobs at this point,” Brooks said. The county’s unemployment rose in June to 6.5 percent from 5.7 percent in May, still lower than Pennsylvania’s rate, which rose to 7.5 percent in June from 7.3 percent. The country’s rate rose to 8.3 percent for July, up a tenth of a percent since June, according to the Bureau of Labor Statistics. Costello said underemployment, when people take jobs beneath their skillset, is also an issue. Vaughn said other economic issues, including funding for public education and infrastructure improvements, are important to Chester County voters because they are investments in the future workforce. Chester County Commissioner Vice Chair Kathi Cozzone, D, said voters will also take a broader view. “I think all of the issues that are part of the national discussion are part of the local discussions when it comes to the areas that the federal government is involved in,” she said. Kennedy said the message candidates portray on the national scene will be one of the biggest influences on the Chester County vote. Romney, on the other hand, needs to continue to talk about his business background and argue that he is the best person to help the economy, Kennedy said. “Whoever wins the narrative nationally is going to drive the decision here in Chester County,” Kennedy said. Brooks said Romney’s choice of a vice presidential candidate is unlikely to be a big factor in carrying Chester County. “I think the vice presidential candidate might help nationally, but at our level, people are gung-ho, ready to go, whether it’s more of a safe pick or more of an aggressive pick,” Brooks said. Both sides said they think their candidate will carry the county in November. “I think a lot of people in the Republican party are not only disillusioned with this president, but they’re scared,” Costello said. Cozzone said she believes “the work and the accomplishments of the president are meaningful to many of the citizens of Chester County” and that Obama will carry the county again. “I think it will be closer than last time, but I think he’ll win it again,” Cozzone said. Comitta said people in West Chester, and Chester County as a whole, vote for the best candidate, not just the one from their party, which she saw when she ran for mayor three years ago. Comitta said she ended up with Democrats, Republicans and third-party members supporters. She told them that she didn’t bring them on to her team because of their party but because they brought “a lot to the table” and she wanted their support. Costello said that, no matter who carries Chester County in November, it will be an indicator of how the rest of the nation will vote. Reach reporter Chris Jessen at chris.jessen@shns.com or 202-326-9868. SHFWire stories are free to any news organization that gives the reporter a byline and credits the SHFWire.